Ladies and gentlemen, there will be a game 3! 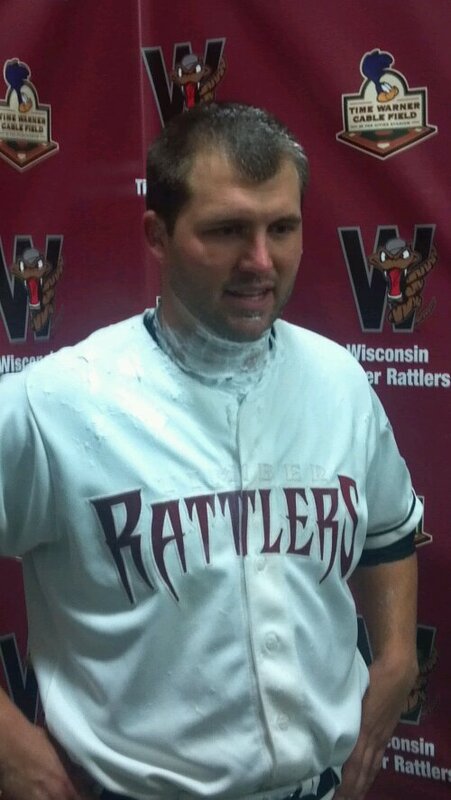 Facing the threat of elimination, the Wisconsin Timber Rattlers took game 2 of their best of 3 series with the Burlington Bees on Thursday night and in the process, tied the series at a game a piece. And they did it in true Hollywood fashion. It was a “home town boy makes good” kind of story as Fond du Lac’s own Chad Pierce who faced the pressure and put together the only 9 inning complete game shutout of the year (Mark Williams had a 7 inning complete game earlier this season). The Rattler bats helped to ease the pressure early as the team put together 3 runs in the bottom of the 1st, and a 4th in the 2nd inning. It would turn out that these would be the only scores for either side all evening. “The offense gave us some runs in the beginning, and you know, that’s what a good team does, score early and hold ’em” Pierce said post-game. The win comes on the back of a 4-0 shutout in Burlington on Wednesday, which forced the team into a corner. It was now going to be the teams first home game of 2012, and possibly their last. Game 3 will be played tonight at Fox Cities Stadium with a 6:35 pm first pitch. This entry was posted in News and tagged Ben McMahan, Brandon Macias, Burlington Bees, Chad Pierce, Chadwin Stang, Matt Erickson, Midwest League Playoffs, Midwest League Playoffs 2012, Wisconsin Timber Rattlers, Yadiel Rivera. Bookmark the permalink.